handling the word breaks as it does for other Thai web pages. 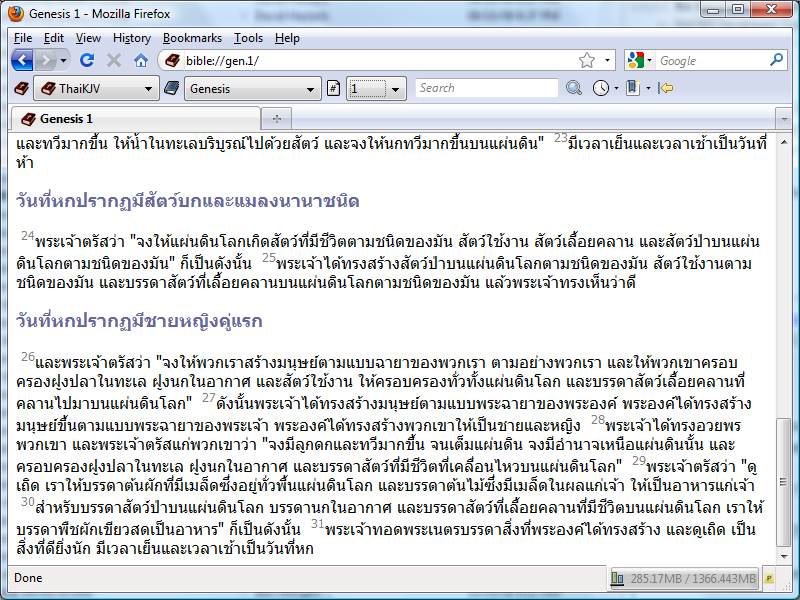 > uses the Firefox renderer, which I assume is aware of Thai word breaks. >> characters and had to use spaces which was unnatural for them. >> probably Burmese but that is even more complicated. >>> Thai falls into the "I never thought about that" category for me. >>> occurred to me that we need smart display to find word breaks. >>> I'll be working on that for BibleDesktop. >>> I'm not sure that the OSIS should have unnatural zero width spaces. >>> That just seems wrong. Maybe the module should. >>> My guess is that we need to use ICU to find the word boundaries. >>> release will improve that. >>>> This is too bad because I like the clean simple interfaces. >>>> the characters are small.